That little lizard that has become so effective selling car insurance - the gecko - can climb across glass windows and across the ceiling. You knew that, right? The science of that ability has intrigued researchers at the University of Akron for several years because it has so much potential for application in such areas as construction materials and medicine. They're so intrigued, they're asking tougher questions of the 50 little lizards kept in two labs at the Auburn Science Center. "OK, buddy, how about this one: Can you walk on Teflon?" The answer: not very well. The popular DuPont nonstick product not only resists cheese omelets, but it also presented a significant challenge to the hairy toes of the gecko. Yes, hair. That's the secret. Not glue or liquids or surface tension. They have hairy toes - much like bristles - with thousands of them in one square millimeter, tipped with something called a spatula, so tiny that it is not much larger than the wavelength of visible light. And what researchers have found is that the questions are endless, and students are a tremendous resource. Undergraduate student Nicholas Wucinich, for example, a biology major who will graduate in May, asked: What if the Teflon is under water? "I didn't have an answer," said Alyssa Stark, 31, a doctoral candidate in the university's integrated bioscience program. "I also didn't think the results would be all that interesting. If they don't stick in air why should they stick in water?" And so experiments were run, and Stark and her colleagues were in for a surprise. "There is an important moral to this story," Stark said. "Always listen to your students." Dr. Peter H. Niewiarowski, professor of biology and integrated bioscience and one of the principal investigators at the University of Akron's Biomimicry Research and Innovation Center, likes to talk about the Tom Cruise character in the film "Mission Impossible: Ghost Protocol," who with gecko-like gloves was able to climb the shiny surface of a skyscraper. Cruise and his sticky gloves helped save the world. "Having the ability to climb like a gecko immediately captures the imagination of kids and adults alike," he said. "Why is that scene so engaging? I suppose it is the degrees to which it seems so within our grasp. ... Bugs and geckos can do it. How is it we can't with all our engineering and technology prowess?" While the movie trivializes the application, Niewiarowski said it helps translate to the public how important the practical uses of the gecko sticking-mechanism could be. There are revolutionary implications, he said. A material that has the sticking-power of a gecko's feet could lead to new construction materials or for bandages or closing wounds and skin after surgery. "We use fasteners that are hard to acquire or involve toxic by-products that are hard to recycle," he said. "What if you can fasten the corners of walls by using a gecko-inspired fastener? Then you could break down the walls and move them around and create a different living space." One Akron company already has capitalized on the research. ADAP Nanotech LLC received a $250,000 investment from the nonprofit JumpStart Inc. in March 2012 to pilot the production of an adhesive that dissipates heat and can be applied inside electronics, which often require expensive cooling processes. Niewiarowski said that as they make new discoveries about the gecko, the possibilities for application expand. "I think we really still don't understand how geckos deal with wet environments and remain sticky," he said. "We don't know if they avoid wet surfaces or avoid being active when surfaces are wet or if they have some other tricks," he said. Working with geckos "that spend all their time in the laboratory" may in fact be limiting. Niewiarowski, 52, originally from Ossining, N.Y., became fascinated with lizards as an undergrad when he took a desert ecology course at Marlboro (Vt.) College. He received his Ph.D. in biology from the University of Pennsylvania and has been at UA since 1995. 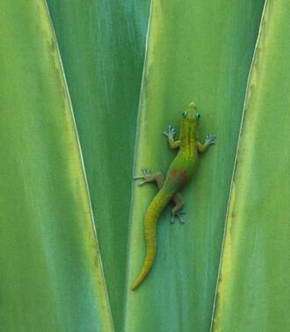 The gecko's "ability to stick to almost anything, their incredible diversity," are what intrigues him, he said. Polymer science professor Dr. Ali Dhinojwala, one of the lead researchers, said that as a scientist who studies adhesion, one of the most significant challenges is that synthetic sticky things don't easily release, as does a gecko foot pad. For example, he said, duct tape stuck to itself is nearly impossible to pull apart. He also is fascinated with the fact that the gecko foot pads are self-cleaning, which means they can walk on a dirty surface. Dhinojwala received his undergraduate degree in chemical engineering at the Indian Institute of Technology in Bombay, India, in 1986, and his doctorate in chemical engineering from Northwestern University in 1994. Using carbon nanotubes, or molecular cylindrical tubes, researchers have developed a "gecko tape" that is more sticky than the gecko's feet. The recent discovery about wet Teflon is very important, he said. "It probably should have been obvious," he said. After all, they can walk on wet plants. "Ninety percent of the time I get calls from companies and organizations to help me design material which would stick in water," he said. Within the next few months, he said, results of a new study that was an outgrowth of the water discovery is expected to be announced at the University of Akron, Dhinojwala said. "You will see major products out there," said Dhinojwala. Should be Easy for Humans Too! Make Light, Transparent, Extremely Thin, Non-Flexible Plastic boards with Zillions of hairs attached on one side. Tie 4 of them to 4 limbs...Start climbing ..only..a Sturdy, Flat wall that would not break! Do it over a Pond. Falling in water with a soft bed should not hurt! Did you read about Transparent Graphite recently? MAKE THOSE BOARDS REAL WIDE! Making gadgets to attach to the boards mentioned in the above comment should not be a big deal! I missed the connection between the dots. They aren't able to stick "very well" to teflon - as if that is meaningful. Teflon is a brand name, not a substance. Like saying they don't stick to a Ford. Anyway, put them in water (where their net weight is close to zero) and they stick? Anybody using spit to stick paper together knows water can, in some circumstances increase adhesion. Was the teflon vertical with a flowing sheet of water over its surface? Or was it just wet? (not that water wets teflon, LOL). Perfluorinated ethylene (aka "teflon") comes in many compositions. It also can be fabricated in multiple ways that significantly change its surface. Virgin polished cast teflon (no filler)? The "reason" teflon is so "nonsticky" is because it has a weak surface layer that is easy to remove. Its the molecular version of a rosin bag (ie baseball's famous non-stick powder). Ah! I see this was taken from a newspaper, no wonder it insults the reader's intelligence.